Towards the end of the 1982-3 academic year, first year students at Limerick School of Art & Design were asked to examine the concepts of ‘place’ and ‘space’ through a land art project. Five of the class formed a temporary collective named DUSAA 5, and for two weeks they worked to realise their brief. Against the background of growing public impatience with the drawn-out planning for a new bridge across the Shannon – sometimes referred to as ‘the third bridge’ – to ease congestion on the city’s existing bridges, DUSAA 5 decided to make a modest proposal. Their Third Bridge would facilitate an analysis of several interrelated issues: the linking of diverse and contrasting locales; the crossing of borders; the presence (or absence) of the citizen in the planning process. Thus, in some respects, Third Bridge exemplified what Suzanna Lacy would later refer to as ‘new genre’ public art. Third Bridge was constructed from 180 polystyrene ‘bricks’, strung together, bracelet-like, by two 185 meter-long nylon ropes. The upper surface of each brick was coloured yellow, to evoke the Yellow Brick Road that took the young Dorothy Gale to the Emerald City, home of the wonderful wizard, in the 1938 film, The Wizard of Oz. For others, it evoked Robert Smithson’s 1970 work, Spiral Jetty, at Great Salt Lake, Utah. Early on the morning of 10 June, DUSAA 5, their teachers, and helpers made their way from the art school to Arthur’s Quay. From there, Third Bridge was slowly lowered from a boat rowed across the river. The ropes were then anchored firmly on either bank. Soon after, a resident of Clancy’s Strand, angry at the disturbance, cut Third Bridge free and it began to float downriver. It was soon retrieved and the damage repaired. Three days later DUSAA 5 gathered again to reposition Third Bridge. This time the knife-wielding resident remained calm but a wind blowing upriver and a strongly ebbing tide combined to de-stabilise it. Just four hours after its successful opening, Third Bridge was hauled ashore. It had served its purpose. In 2015, Ormston House invited Andrew Kearney and Deirdre Power to revisit the events of June 1983. Much has changed in the intervening thirty years but the recent proposal to re-name the bridge that eventually opened as Shannon Bridge in 1989 (the names of John Fitzgerald Kennedy and J.P. McManus have both been floated), and the proposal to construct a new pedestrian bridge from Arthur’s Quay to King John’s Castle as a tourist ‘destination’, continue to raise questions regarding the control of public space and the purposes and benefits of such projects. This is where the artists position Third Bridge. The exhibition has three elements. The first is a photographic record of the installation of the original Third Bridge in 1983. The second is an archive of contemporary documents that illustrate the context within which the original project was framed and realised. The third is a site-specific installation at the Sylvester O’Halloran Footbridge, close to the site of the original Third Bridge. Its flowing yellow flags – a dancing curtain within the encaged bridge, a fantastical spectacle reflected on river and cityscape – commemorate the journey of the five students in the summer of 1983. Accompanying the exhibition, the artists have produced an 8-page newspaper publication which includes archival documentation of the project in 1983, a text and timeline by historian Prof. John Logan, and related newspaper articles. A limited edition, silkscreen poster by Martin Shannon will be available for sale during the exhibition. Proceeds from sales will go to the making of a documentary film on the life and work of Martin Folan (1953-2014). Special thanks to Miguel Foto Lab, The Hunt Museum, Limerick Marine Search & Rescue and Limerick 2020. 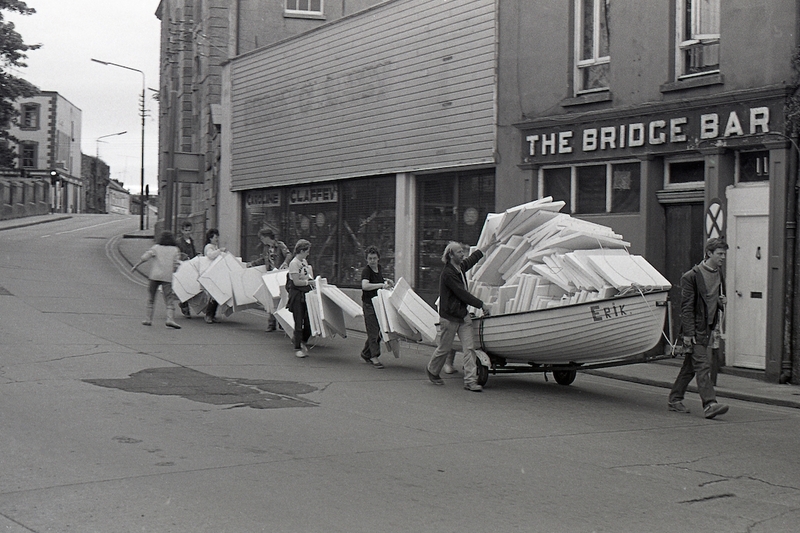 Third Bridge (1983/2015) by Andrew Kearney and Deirdre Power is an archival project stemming from collective student action at Limerick School of Art & Design. Third Bridge is part of Prequel, an annual project drawing on the history of Ormston House. Andrew Kearney and Deirdre Power were founding members of 10+ All Sorts, an artists' collective based at Ormston House from 1984 until 1989. Image: photograph courtesy of Deirdre Power, 1983/2015.